Starring Lowell Thomas, Paul Mantz. Starring James S. Parker, Lowell Thomas, Christopher Young. It's the third year for double releases of fantastic 3-panel Cinerama Road Shows on DVD and Blu-ray. In 2012 the disc label Flicker Alley brought out restored Blu-rays of the original This Is Cinerama and a travelogue called Windjammer, and just last year we were given the second and fifth Cinerama shows, Cinerama Holiday and Cinerama South Seas Adventure. The reconstruction and restoration program was carried out by a team of enthusiasts under the leadership of editor-technical expert David Strohmaier, who is now Director of Restoration at Cinerama Inc.. Strohmaier was an important consultant on the restoration of Warners' MGM-produced How the West Was Won. For that disc release he came up with the clever of 'Smilebox' formatting concept for video. Theatrically, Cinerama plays on a curved screen and really can't have the same impact when imaged flat. The use of the Smilebox (see the posted images) simulates the curvature of the theatrical experience. It also helps to correct perspective mismatches between Cinerama's three panels. Just out are two new discs - separate purchases - that represent even more complicated restorations: the third Cinerama release Seven Wonders of the World (1955) and the fourth, 1958's Search for Paradise. Each picture is a technical marvel filmed under difficult circumstances and a look back at a cinematic grandeur that modern movies seem to have lost. Today one person can throw a switch and a 4k projector can fill an enormous screen with a sharp, colorful and flicker-free image. The three-panel colossus known as Cinerama required a coordinated team effort to put on a single show. 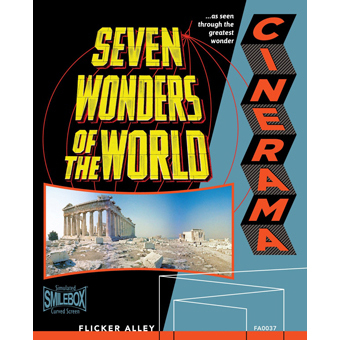 This Is Cinerama and Cinerama Holiday were straight travelogues, and 1956's Seven Wonders of the World follows the same format, on a larger scale. In a standard-35mm opening Lowell Thomas talks about the Seven Wonders of the Ancient World, and tells us we'll be looking for more. We think co-producer Merian C. Cooper must have dreamed up the idea, as it fits in with his own daring round-the-world silent documentaries. The title reminds us of Cooper's King Kong, the 8th Wonder of the World. The paintings Thomas displays are the work of artist Maria Larrinaga, also from Kong fame. The show relies heavily on aerial footage by the legendary pilot Paul Mantz, who manages to frame fantastic Cinerama vistas on the fly, so to speak, zooming above famous scenery the world 'round: the Statue of Liberty, the Pyramids, Angkor Wat. South America is mostly covered from the air -- Iguazu Falls, Rio de Janeiro, the massive Venezuelan mountain-mesa that inspired Sir Arthur Conan Doyle's The Lost World. Then it's hop, skip and jump across the globe. We hit the major tourist stops from the air, buzzing downtown Rome, Pisa (find the Leaning Tower, it's pretty small), Paris, New York and Naples. We also see a few more exotic ancient cities in the middle of Arabian and Saharan deserts, and high in the Himalayas. It would seem they had already decided to save Australia and the South Pacific for another film. We're also reminded that some desired locations are behind the Iron Curtain. To provide this feature's equivalent of a rollercoaster ride we get a fairly silly runaway train scene on a narrow-gauge railway in Darjeerling, India. It's filmed in sped-up motion. The other major attraction is exotic dancing women in costume, in Japan, Cambodia and India. In India a tiny child imitates the dance moves of the older pros; both there and in Cambodia the filmmakers pose a dance troupe in an ancient ruin or tourist destination. A Tokyo stage revue features Japanese showgirls dressed up as if in a parody of an American gala revue from the 1930s, except that they spin parasols a lot. I suppose this means that the crudely Americanized Japan in Sam Fuller's House of Bamboo isn't a joke -- that's how things were. Japan is presented as a place where American G.I. 's can 'get to know' pretty Geishas. The women stand in full makeup to wave to our boys in uniform as they depart. And little kids in kimonos wave to the planes from a garden. The filmmakers stick to the idea that little foreign kids follow uniformed Americans everywhere. The new state of Israel is lauded in an earlier episode that finishes with a Cinerama view of the Via Dolorosa and Calvary Hill, complete with sermon. Although we see Muslims praying, Lowell Thomas can joke about an Indian wedding parade, or an Arab walking in the street: "Look out for that camel, Abdul." One scene shows baby elephants being trained to serve as beasts of burden. In 1956 I'm sure the thought would be, 'how cute'. Seeing the innocent Dumbos yanked with ropes and prodded with sharp poles, we no longer have the same reaction. In Rome a little scenario follows a couple in a motorcycle sidecar rushing their little boy to the Vatican to get the Pope's blessing. They miss him there but catch a front row seat at a Villa, when the Pope repeats the rite in close-up (that's medium-wide in Cinerama terms). Lowell Thomas considers this a filming coup; it provides the finale for the show. There are impressive stunt scenes as well. At one point Paul Mantz's B-25 camera plane flies low over the caldera of a smoking volcano. In Cinerama any object that appears near the camera is actually much closer, so flyovers like that are riskier than they look. Mantz also flies under four bridges in a row in New York's East River. Mantz was a respected pilot and a daredevil in the Cooper-Schoedsack school of old-line adventuring. Cinerama is surely meant for that massive screen. The extreme wide-angle view envelops the audience in the location, yet we don't get close-ups of anything - on the giant screens, a close-up would look like microphotography. People that seem fifteen feet away are actually six or seven feet away. Most shots are either locked down, creating vast panoramas with multiple focus points, or forward trucking shots that instantly put us 'in the picture'. Whenever the camera pans, the panels distort as in a giant funhouse mirror. But we want the frame to move, because the result is an effect similar to 3-D. Considering these limitations, the directors of the later two MGM Cinerama dramatic features did a marvelous job. 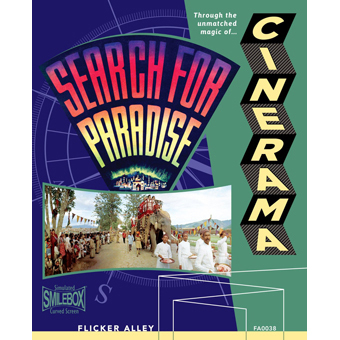 Made in 1957, Search for Paradise is the first Cinerama show not to take us around the globe; it instead follows another concept partly derived from the movies. Forgetting to mention author James Hilton but clearly inspired by Frank Capra's 1937 film Lost Horizon, Lowell Thomas would like to take us to a high llamasary, but grudgingly informs us that the desired location is in the hands of the Chinese Communists. Thomas' substitute is to attend the coronation of a new king of Nepal. 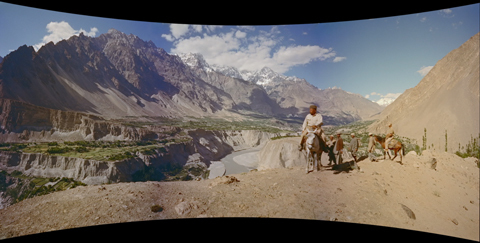 Much of the film stays on the ground, as a large safari moves through the upper reaches of Pakistan to the Karakoram Mountains and then the Himalayas. Meeting a pair of airmen supposedly ready to leave the Air Force, Thomas invites them to come along on the cross-country journey. The Air Force sergeant is used for comic relief. He's always sleeping, and to climb a steep trail he hangs on to the tail of a horse. When twenty or so porters carry the jeep by hand up a steep trail, the Sarge rides on top, Pharaoh style. We travel by jeep up a frighteningly narrow road over a deep gorge. This time I'm told the camera is not undercranked to effect a speed-up, but it still looks too fast and dangerous for comfort. The group camps in high arid mountain country. When they come to the end of the road, they switch to horses. It's interesting that the filming company obviously went on a real adventure, to film pieces of a made-up-adventure, that's supposed to be real. Rather magical things happen. They're on horseback when they arrive at another camp. After they're forced to dismount to walk cross an extra-long, narrow rope bridge, they're back on the horses again. The same thing happens when the adventurers take a large raft down some rapids in the Indus River. Why they're descending after climbing so far is not explained, but when they alight, they're once again back on the horses! I think they left out the scene where the horses took a Greyhound bus to catch up. The landscapes are really impressive. The towns and cities they find are the very definition of remote. One rather forbidding city is on a mountaintop next to another deep gorge. It's in full sight, but because of the terrain our travelers are still more than a day's ride away. The ruler in charge seems to be the boss of everything, all the way to the border with the Soviet Union. Search for Paradise creates a feeling of far-flung adventure in lands that seem a hundred years in the past. We soon realize that the mission to find Shangri-La is just a pretense for an excursion into these far-flung hinterlands, but this is a travelogue, not a documentary. Even though the particulars of what we see are faked -- a small army of workers supported the Cinerama location effort - they really 'went there'. 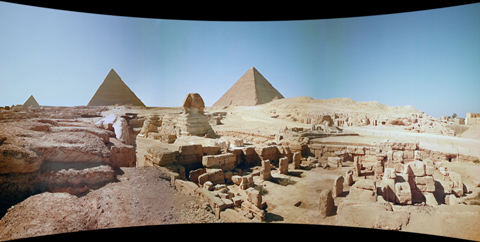 Through the wraparound Cinerama lenses, we feel like we're with them too. Knowing we're far up in some remote highlands, the gardens of Shalimar are indeed pretty amazing. One city clings to the cliffs on the side of a river, and another looks something like the high-elevation location at the end of David Lean's A Passage to India. The Allies in WW2 must have used it as an airport to get supplies to the Asian fronts, for a line of rental boats have names only soldiers would understand, like Killjoy. Holding the various parts of Search for Paradise together is the music score by Dimitri Tiomkin, who composed the deliriously beautiful themes for the original Lost Horizon. It's definitely his kind of music, with exciting adventure cues for the jeep ride and river raft sequences, and ethereal passages whenever we're confronted by an impressive vista or an inspirational bit of narration. A peaceful lake may be accompanied by soft music reminiscent of cues in The Guns of Navarone. Elsewhere we hear marching music such as heard in Tiomkin's Land of the Pharaohs. 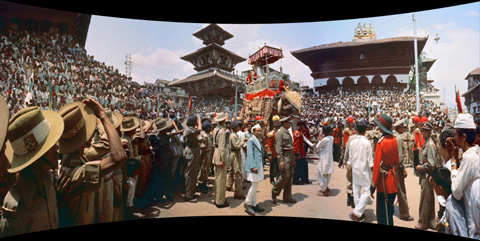 The movie eventually arrives at the big coronation sequence in Nepal. Here's where the film's '50s attitudes come forth. At various parts of the picture Tiomkin offers songs with vocals by the Opera singer Robert Merrill. The words are shallow and dismissive of the places and cultures we see. Despite the gardens and grand palaces, life there looks hard and the people poor. As this is a travelogue we're just sightseers, and not looking for deep insights into the culture. But the lyrics pretend that we're getting close to paradise - "the people aren't too poor or too rich, I don't have to work too hard," etc. It's all painfully condescending. The original book Lost Horizon dreamed of an Asian hideaway that's basically a leisure resort for disillusioned white colonials tired of war and destruction, where one can think in harmony while happy foreigners do the work. The Cinerama camera also films a visiting Chinese official, while the narration calls him a Red and a Commie, and criticizes his clothing. Lowell sneers that a Commie looks pretty funny at a monarchical coronation. The anti-Communist bent is no accident. The U.S. government seized upon Cinerama as a Cold War propaganda tool, to outshine the Soviets pushing their own anti-U.S. propaganda in trade shows overseas. Merian C. Cooper would surely have approved; as a young man he had flown fighter planes against the Soviet Reds during the civil wars of the 1920s. From the disc extras we learn that Thomas received military cooperation through the strategic bombing hawk, Air Force General Hap Arnold. This explains Cinerama's carte-blanche access to military hardware and the latest jets. The process began as a gunnery teaching aid for the Army, after all. Knowing this makes the end of Search for Paradise particularly weird. After admitting that searching for a real Shangri-La is a pipe dream, Our two military men return to the United States and re-enlist to worship a substitute paradise: American military power. Dimitri Tiompkin's rapturous main theme launches along with a flight of jets. They climb ever higher into the gleaming sunlight as a choir sings lyrics that are half- Christian hymn, half- Air Force flight anthem: "On silver wings... / Up we go!" Metallic jet-angels soar into the stratosphere while the music tells us they're on their way to heaven -- even though we know they're weapons of war. It's a strange blend of religion, patriotism and technological force. Today we're reminded not of heavenly rapture but of the dynamic-but-cold finales of The Fountainhead (the Superman is erect!) and Things to Come (next stop, the stars!). H.G. Wells' concluding lyrics asked the question, "Which Shall It Be?!" (the mud or the stars), while Search for Paradise asks rather foolishly, "Is It There? Is It There?!" This super-travelogue preaches that heaven that can be reached as long as we're going somewhere in a big hurry. Both Seven Wonders of the World & Search for Paradise are impressive technical achievements. Flicker Alley's Blu-ray/DVD special editions offer choice of 5.1 or 2.0 sound for each title. The presentations include full Overture, Ent'racte and Curtain music; the shows open through a simulated Cinerama curtain, and are displayed in the Smilebox curved-screen format. The restorers have done wonders with the color and the registration of the three panels of each show, which must have been a nightmare of trial and error to organize. We fully understand why the discs are on the pricey side. The extra-special extras were produced by David Strohmaier. Elaborate restoration demonstrations detail the complex, technically touchy task of re-synching of the three negative strips and finding secondary substitutes when parts of the negatives are missing; the amount of color restoration now possible is amazing. One problem involved a fly that found its way into the camera housing in one shot. It is visible as a silhouette -- sometimes a double silhouette. They were able to get rid of most of it. Each title also comes with a breakdown reel to be shown when there's a problem in the projection booth. For Paradise Thomas brings out Dimitri Tiomkin, who speaks as well as he can in his thick Russian accent. Various trailers are present, along with other galleries. Seven Wonders' unique content includes an hour-long documentary about the many composers who worked on the film, hosted by Jon Burlingame. It also has a featurette about a portable (and inflatable!) Cinerama Theater built to travel through the French countryside. One of the celebrities attending is Abel Gance, whose (partly) 3-Panel Napoleon premiered 25 years before This is Cinerama. Search for Paradise has some BTS footage of the filming on an Air Force base, an interview with director Otto Lang, and a Powerpoint about the making of the film. 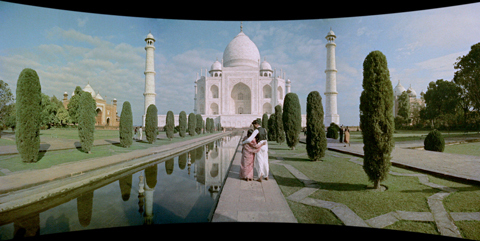 Of special note is the presence of In the Picture, David Strohmaier's 2012 Cinerama short subject that takes viewers on a tour of various Los Angeles locations. It begins at a lookout in the hills above the Hollywood Bowl that's Savant's favorite stop-off when giving tours. It's accompanied by a making-of docu of its own; Strohmaier's experts took an original Cinerama camera out of mothballs and made it work. It's a heck of an achievement, with performances and dialogue pitched in the old, stiff travelogue style. Each title comes with a Blu-ray and 2 DVD discs, both of which carry all the extras. Also included are printed reproductions of the original Road Show souvenir programs. Video: Excellent it's a miracle they can be seen, so occasional faded color is not an issue. Deaf and Hearing-impaired Friendly? N0; Subtitles: none. 1. I can't help it. The song "This Is my Country" immediately reminds me of the campaign buttons in Taxi Driver, the ones that Albert Brooks wants the printers to re-print: "No, no, the buttons we ordered are supposed to read, "This IS my Country". Your buttons read, "This is MY Country". No, I think there IS a difference."